You probably think it’s old fashioned for your mom to send you on an errand with a checklist on hand. But let’s be real, you’re bound to forget that your mom needed eight eggs, not three. 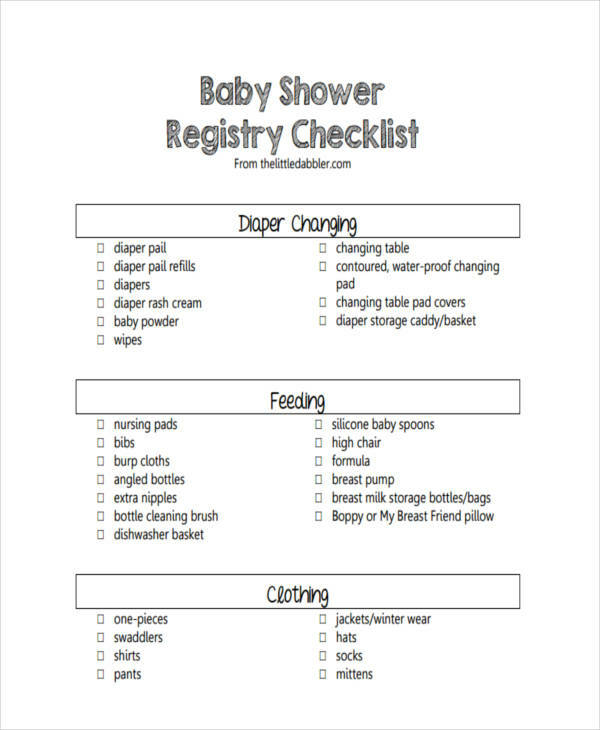 A printable checklist is a list of information you want to be reminded of. Some people find it so important that there are actual checklist tips to making a good checklist. Checklists prove to be useful for our day to day chores. People find different uses for a checklist, whether it’s for one’s daily to-do lists or for a list of items required. 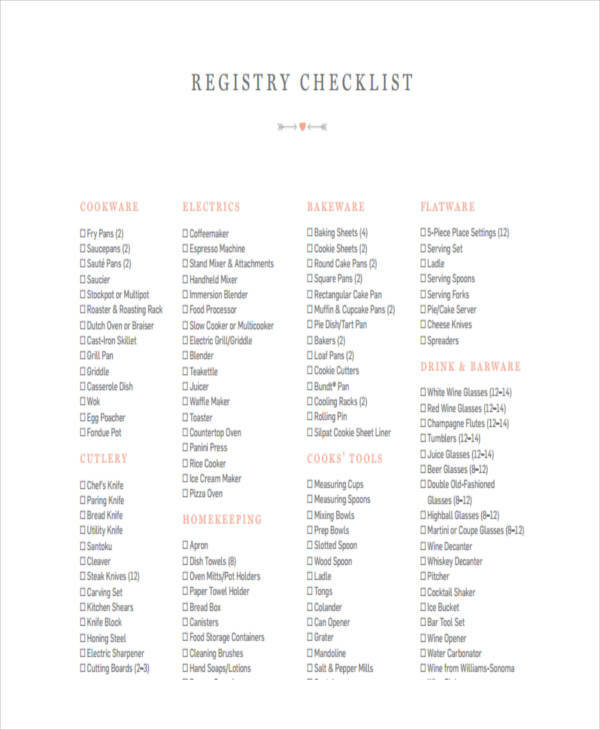 What Is a Registry Checklist? 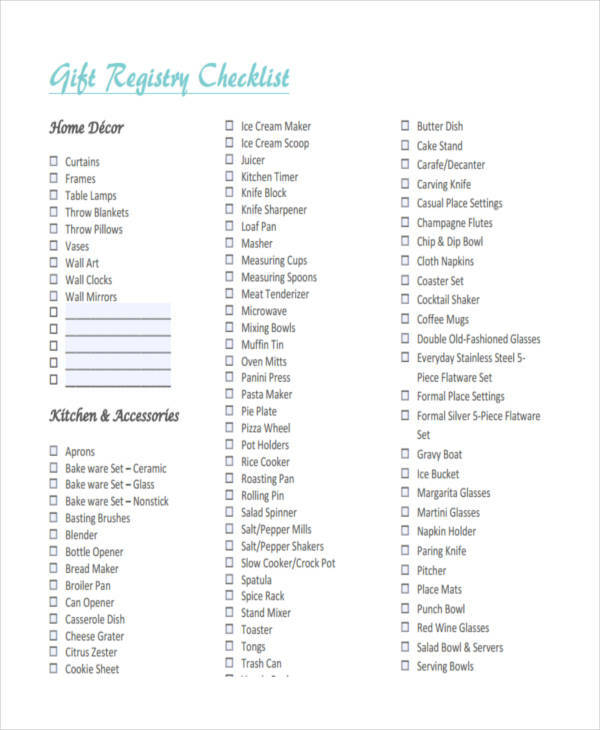 A registry checklist is often used to assist individuals, such as engaged couples or expecting parents, in communicating with guests for gift preferences. 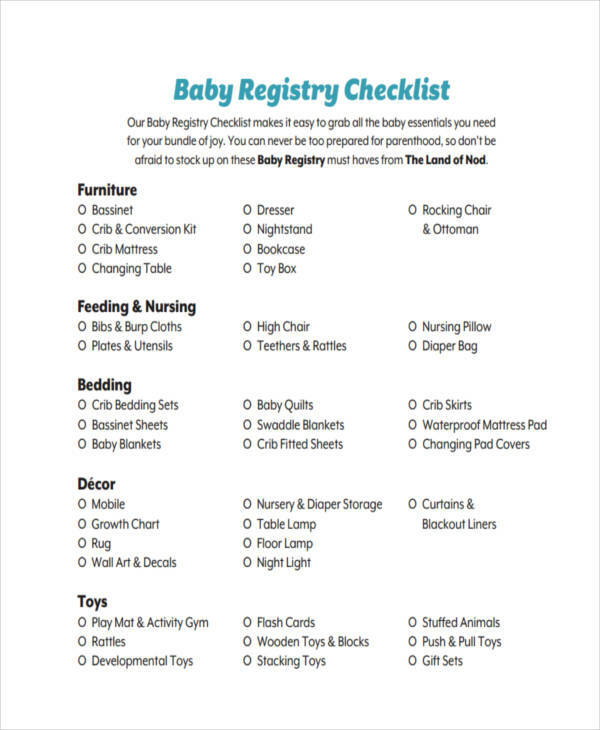 To give you a visual representation, there are checklist examples in pdf that can serve as your basis in making your own registry checklist. 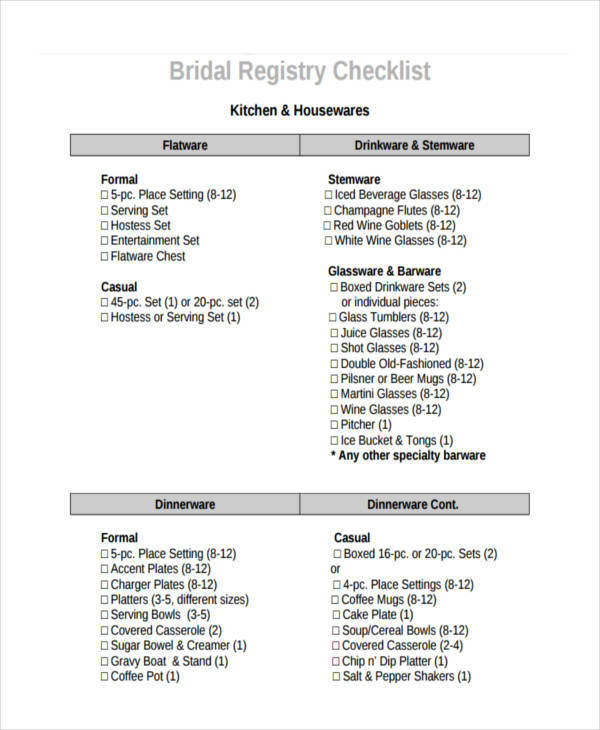 What to Put on a Registry Checklist ? For engaged couples and mom-to-be’s, it can be very hectic with all the preparations that need to be done before the big day. 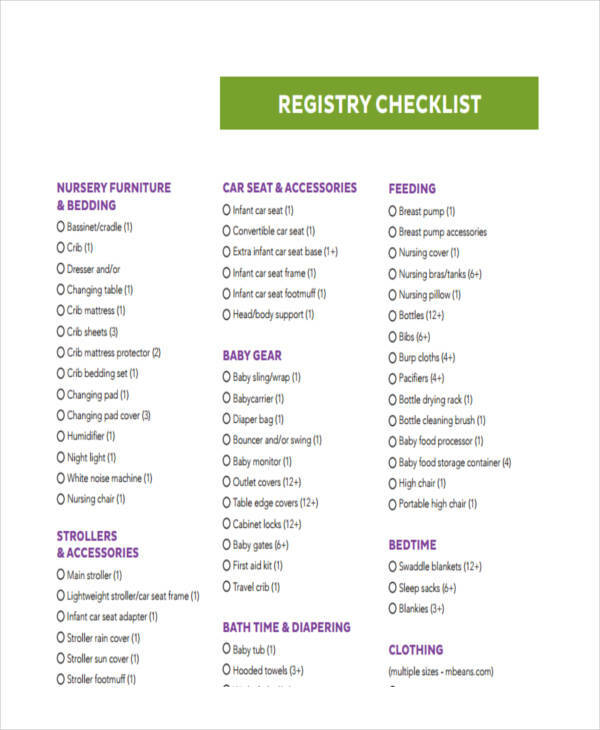 It might not be on the top of your list, but having a registry checklist must be a priority. 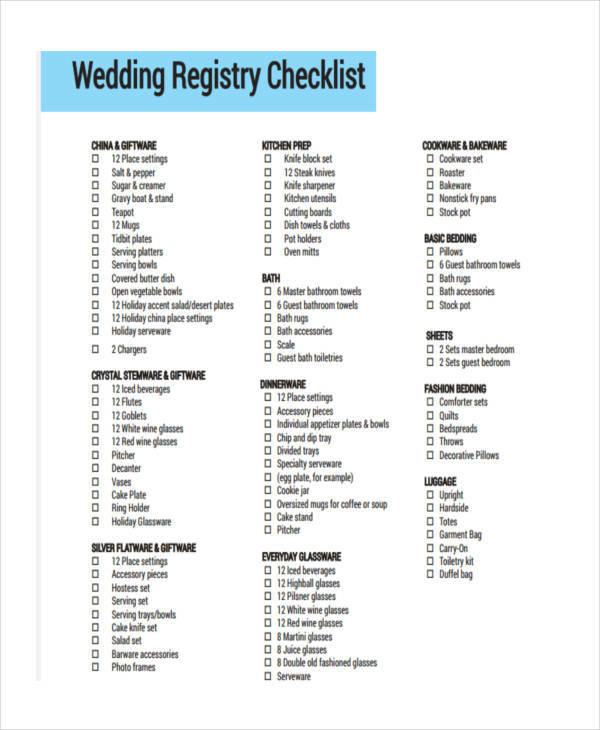 A registry checklist must contain the essentials. These are classified as the basic necessities in our household that we often take for granted. Look around your house and ask yourself, do I need this? Remember to prioritize what you need and not what you want. It’s also good to register to more than one retail store to provide a wider range of gifting options. Using checklist examples in word may also make the job a whole lot easier. A checklist is used to inform or remind an individual on what is needed. Starting out with a blank checklist would be a good way to list everything you need in an organized manner. Registry checklists are often utilized to inform guests and loved ones on the essential items for individuals that are starting a new chapter of their lives. It lists the basic necessities that are a part of our daily schedule, such as bed sheets and kitchen utensils. Family and friends of the recipients use the registry list as a basis for gift ideas as these items can be quite costly for individuals to purchase on their own. People often overlook the whole point of a registry checklist, thinking it contains nothing but the wants and needs of an individual. But in reality, it plays an important role for providing useful gift ideas. A registry checklist not only guides a buyer on what to purchase, but it also prevents duplicate items. Think of it this way, what would a person do with three toasters? A checklist is a good way to inform other guests that an item has been purchased and that there are other items that would still be useful. There are checklist examples in excel that would help guide you for creating your own.